♦ Bókverk: Á morgun laugardaginn 1. nóvember opnar í Menningarmiðstöðinni Gerðubergi sýning á bókverkum úr smiðju sjö meðlima í listamannahópnum ARKIR. Öll eru verkin unnin úr gömlum bókum sem flestar voru áður til útláns í Gerðubergssafni. Þessar slitnu og afskrifuðu bækur hafa nú verið „endurbókaðar“ á margvíslegan hátt. Sýnendur eru Áslaug Jónsdóttir, Anna Snædís Sigmarsdóttir, Arnþrúður Ösp Karlsdóttir, Ingiríður Óðinsdóttir, Svanborg Matthíasdóttir, Sigurborg Stefánsdóttir and Kristín Þóra Guðbjartsdóttir, sem jafnframt er sýningarstjóri. Nánar má lesa um bókverkin á bókverkabloggi ARKANNA og heimasíðu Gerðubergs. 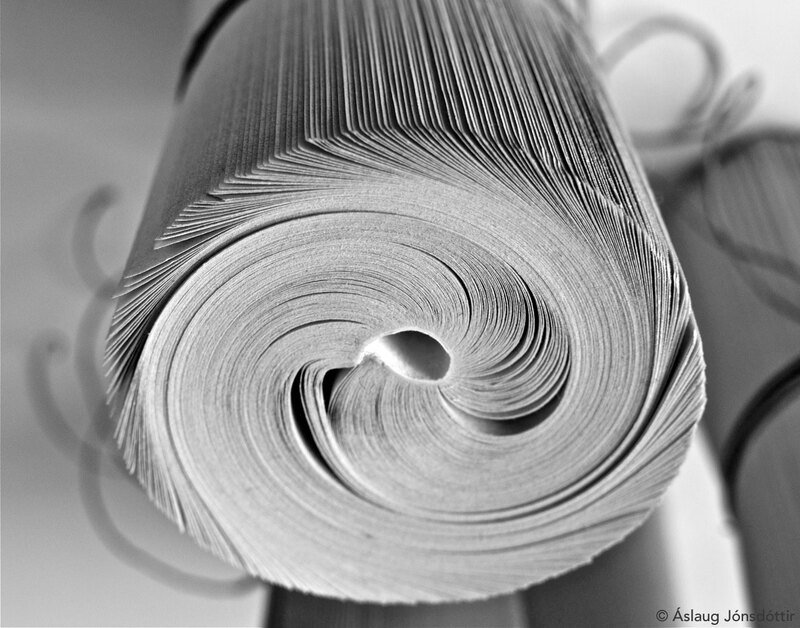 ♦ Book art: Along with six fellow artist in ARKIR book arts group I am opening an exhibition tomorrow, November 1st, at Gerðuberg Culture Center. 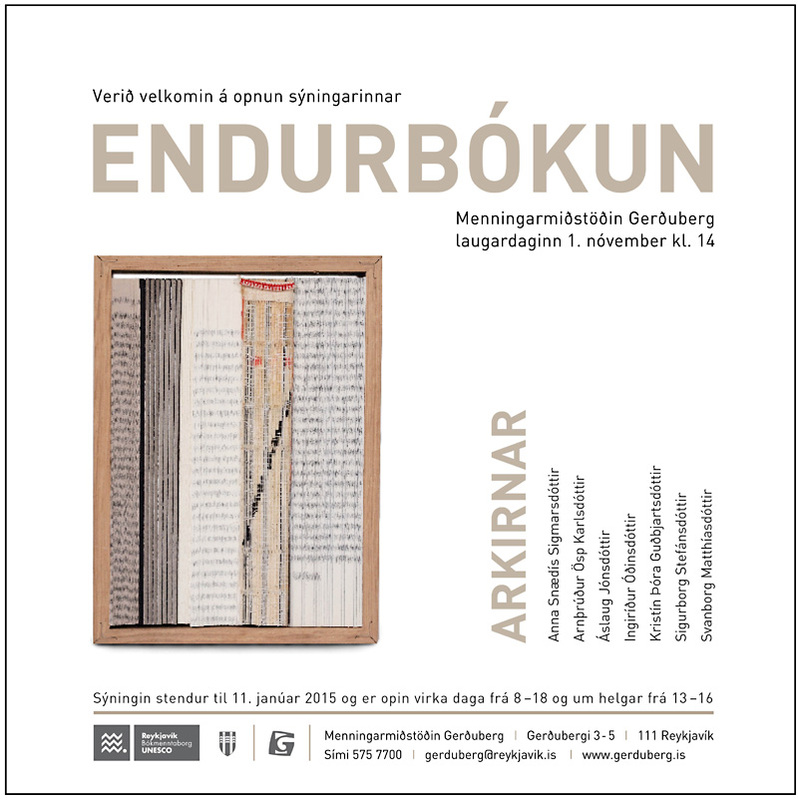 Seven ARKIR-members show their works from recycled and re-used books at “Endurbókun” or “Re-booked”. Participants are: Anna Snædís Sigmarsdóttir, Arnþrúður Ösp Karlsdóttir, Áslaug Jónsdóttir, Ingiríður Óðinsdóttir, Svanborg Matthíasdóttir, Sigurborg Stefánsdóttir and Kristín Þóra Guðbjartsdóttir, who also is the exhibition curator. For further information check ARKIR book Arts blog and Gerðuberg’s website. Artwork on poster/invitation below: Svanborg Matthíasdóttir. This entry was posted in bókverk | book art, sýning | exhibition, viðburðir | events and tagged Arkir, Áslaug Jónsdóttir, bókverk, book art, Gerðuberg Culture Center, Menningarmiðstöðin Gerðuberg. Bookmark the permalink.